Jump from exhilarating heights! Let the sea pick you up and take you on a ride! 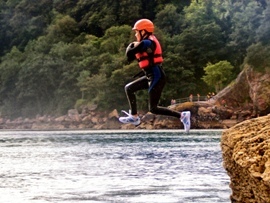 Explore deep sea caves, and squeeze through gaps to discover Devon's hidden gems. Reach Outdoor's guides will set the pace that suits your group and ensure that everyone is set a challenge that meets individual needs but allows the whole group to share the experience.